Three members of Northmor’s two-time league champion boys’ basketball team recently made their college choices official. 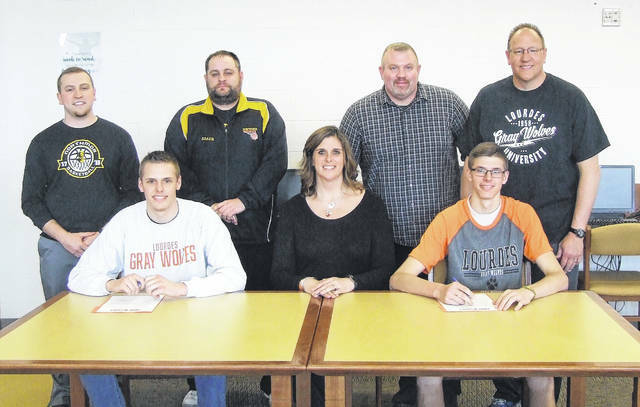 Both Kyle and Tyler Kegley announced they would attend Lourdes University, a NAIA school in Sylvania. Brock Pletcher will also stay in-state, as his pick was Division III Wilmington College. While the two Kegleys will continue to play as teammates at Lourdes, Tyler noted that wasn’t an immediate goal when the two started their searches. But when it came to Lourdes, both of them found many things to like about the school. Kyle noted that the coaching staff played a big role in his decision. “Just how they handle everything and interact with players,” he said in describing what he liked most about the coaches. Tyler, who also cited the school’s academics as a positive, is planning to major in pre-med or biology and then eventually transfer to another school, preferably Ohio State, for optometry. Kyle is majoring in early childhood education. Both players noted that the coaching staff found a lot to like about their potential. After a four-year stretch at Northmor that ended with a pair of conference and sectional titles, as well as both Kegleys being named second-team picks in the KMAC and honorable mention district selections as seniors, the two had a lot of good memories about playing for the Knights. “Just playing basketball with the team and winning back-to-back conference and sectional titles and enjoying the team play here,” added Kyle. Now that they’re preparing to take the next step, both are looking forward to the step up in competition at the next level. Pletcher also finished his senior season at Northmor with plenty of accolades, as he was a first-team pick in the league, a second-team selection in the Central District and an honorable mention All-Ohioan. While a number of schools were interested in obtaining his services, the Knight senior noted that Wilmington was his front-runner throughout the majority of the recruiting process. Pletcher, who plans to major in business administration, said that he and the school have similar up-tempo styles of playing, which helped make it an easy selection. “They liked the way I played, pushing the ball and taking lots of shots, and they liked my size and athletic ability,” he said. Much like his teammates, Pletcher could think of a lot of positive memories with the Northmor program, in particular his senior season. Now, he’s looking forward to the competition at the next level, noted that virtually anyone he’ll go against has similar credentials to him at the high school level. As they both sign to play basketball for Lourdes University, Tyler (left) and Kyle Kegley sit in the front row with their mother, Heidi. In the back row are Northmor basketball coaches Blade Tackett, Zach Ruth and Ben Pletcher, as well as their father, Jack. Northmor’s Brock Pletcher sits with parents Tammy and Ben as he signs to play basketball for Wilmington College. In the back row are (l-r) Northmor assistant coach Blade Tackett and head coach Zach Ruth.